Whether you’re a Millennial or not, your ERP software selection process is being influenced by Millennial expectations. Learning the features most in demand by this generation can ensure a wise ERP decision and a successful ERP implementation. What are some words you’ve heard used to describe Millennials? Self-absorbed? Tech-savvy? How about Influential? According to the Pew Research Center, Millennials make up the largest generation in the labor force. If you’re considering replacing your legacy system with a cloud ERP solution, taking cues from the Millennial demographic can positively affect your ERP implementation. and subsequent user adoption. Millennials have been criticized as a generation (those born 1981-1996) for their almost obsessive relationship with digital technology. They’re considered “digital natives,” which means they’ve lived their whole lives using technology for almost everything they need, from shopping, entertainment, and paying bills to staying in touch, getting news, and more. For them, 24/7 connectivity using constantly upgraded and improved devices (devices they expect to be intuitive, fast, and flexible) is the norm. And their expectations for their personal devices are transferring into their expectations for their professional ones. Though the article also points out some concerns about BYOD, such as security and possible liability for overtime compensation, this is a perfect example of accepting positive changes brought on by Millennial expectations. Similarly, businesses knee deep in the ERP software selection process should consider including the features Millennials want in their technology. True cloud ERP solutions offer users access to software applications via the Internet, often at a lower cost due to reduced upfront costs, fewer IT support services, elimination of updates and upgrades (handled by the vendor), and the lack of hardware to buy and maintain. However, the real draw for Millennials is that cloud ERP solutions are fully mobile, which means they can access their ERP applications in the office, out in the field, from home, or while on vacation—at any time. This constant connection resonates with Millennials who tend to value variable working conditions and flexibility. As mentioned earlier, Millennials have grown up with innovative technology. Smartphone applications, video games, educational links, and shopping websites are all designed to be used easily and intuitively. As a result, usability has become a key factor when judging the User Interface of a cloud ERP solution. Providing a positive user experience depends on an efficient, easily navigated, and configurable interface. Another way personal technology has affected Millennials and the cloud ERP space is a new expectation to be up and running on a system without days of training—an instant out-of-the-box mentality. 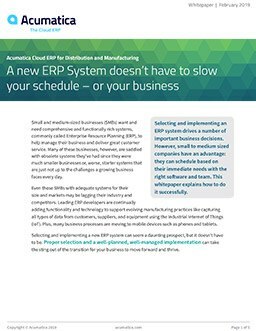 If Smartphone applications, for instance, take minutes to navigate, why shouldn’t an ERP system? And if it isn’t, stop your ERP implementation process right now because your Millennial workforce may revolt! Millennials have no patience for sifting through spreadsheets and reports for the KPIs that can aid them in measuring the business. Instead, they want easily accessed reporting and analytics that provide large amounts of data in real-time through customizable dashboards and drill-down capabilities. These analytics result in informed, fast, and accurate decision making and problem solving. Finally, to round out their ERP business intelligence and analytic requirements, Millennials want insight across the organization and a single version of the business truth. Meetings and conference calls are things of the past, if Millennials have anything to do with it. Texting and instant messaging have opened the door to communicating without lag time. And this communication-now mentality brings with it improved collaboration and productivity. The cloud ERP solution you choose should encourage integrated, collaborative interaction between users. As we’ve discussed, Millennials have high expectations, and the result has been a push for innovative technology. ERP vendors have had to improve their offerings by including features that can satisfy Millennials’ need for cloud ERP software that is flexible, easy-to-use (and learn), insightful, and collaborative. And end users from every generation have benefitted from the increased efficiency and profitability their demands have produced. Acumatica acknowledged these expectations from the start, delivering a cloud-based solution for a mobile and adaptable experience with a full suite of integrated business management applications. Rated by Research Nucleus as highest in Usability out of 22 vendors in their ERP Technology Value Matrix 2018 report and highest in User Satisfaction out of 12 cloud financial solutions in Gartner’s recent Magic Quadrant report, you can be assured that every user from every generation will be satisfied. If you’re looking for a Millennial-friendly cloud ERP solution (along with a Millennial-friendly ERP implementation) that contains the features they expect, then contact our team today. Business Process Reengineering or ERP Implementation — What Comes First?